When Sarina Bowen first announced that she was republishing two M/M romances she had previously written under another name, I had two reactions: (1) shock, because I never came across these two books when I was first discovered Sarina Bowen, and (2) excitement, because the Him series is my all-time favorite M/M series so of course I knew I was going to be in for a treat when I started Goodbye Paradise. Despite its name, growing up in a place called Paradise has been anything but for young Joshua Royce. With no connection to the outside world, the only thing getting him through the past few years is his best friend, Caleb Smith. Josh has had a crush on his best friend for as long as he could remember, but never dared to act on his feelings as he feared what might happen if anyone found out. But when Caleb suspects that Josh may be thrown out from the cult, he must figure out a way to save his best friend before it’s too late. Sarina Bowen truly is the queen of simple and sweet when it comes to writing romances. Although this book deals with some heavy and religious themes, Bowen manages to still add a bit of sweetness to keep things light. Family and friendship play such and important role throughout this book as secondary characters step in to help Josh and Caleb get on their feet. I really liked the fact that two of our secondary characters, Maggie and Daniel, had their own little conflicts going on because it added to the story and these side conflicts ended up bringing these four closer. Caleb is a little rough around the edges and it took me a while to warm up to him. He did annoy me a little when it came to resolving certain issues, but at the end of the day, he has a good heart with good intentions and only wants what’s best for everyone. Josh on the other hand is a sweetheart and I adore him so very much! The chemistry between these two was OFF-THE-CHARTS and despite everything they’ve been through, they still manage to come out on top and find their happily-ever-after! AND LET’S NOT FORGET ABOUT JOSH AND THE BABY BECAUSE CUTENESS OVERLOAD! I legit died every time there was a scene with Josh and baby Chloe. 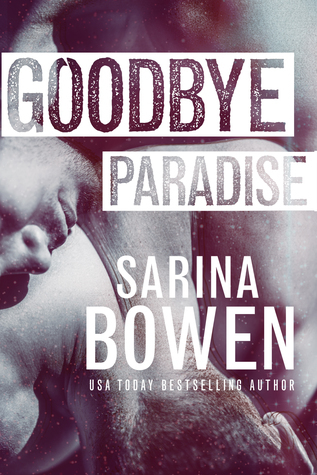 Goodbye Paradise was sweet and heart-warming M/M romance and another hit for Sarina Bowen and I totally recommend it to everyone. Meghan Quinn is an author that has been on my TBR for a while now, but I never found the time to actually read one of her books. However, that quickly changed once I saw the cover and read the blurb of Co-Wrecker because there is just no way I can resist a romance with a nerdy hero (also those abs *fans self*). After one night of fun leads to him being the talk all over campus, Andrew decides to transfer colleges in hopes of a fresh start. He moves into a new house and starts his summer job at the local Friendly’s. There he meets Sadie Montgomery, but the two don’t exactly get off on the right foot. Hoping to get on her good side, Andrew tries to charm Sadie and despite her better judgement, Sadie starts to fall for him. But when Andrew starts getting too close, Sadie will have to decide whether or not to let Andrew in or let him go. I have always threaded lightly when it comes to romantic comedies because they are usually so overly cheesy and predictable that I become bored and want to pull my hair out, but that was not the case when it came to Co-Wrecker. I loved this book right from the first chapter and fell head-over-heels in love with Meghan Quinn’s writing. If I wasn’t laughing, I was crying. If I wasn’t grinning like a Cheshire cat, I was swooning. There was never a dull moment when it came to this story. The secondary characters are a riot, especially Andrew’s roommates. Those girls are something else and I had to stop reading a few times just so I could calm myself down from laughing so much. ANDREW IS MINE! Honestly, where can I find me a guy like him because he’s the total package. Andrew is sweet, caring, passionate, and nerdy! But don’t let the brains fool you because it’s always the quiet ones you got to watch out for 😉. Sadie has been through the ringer with setbacks and let downs and is struggling to get back on her feet. She’s guarded with good reason, but I liked being able to see Andrew chisel away at her many layers and bring out a different side of her. The romance has a bit of a slow start, but once things catch fire, you definitely feel the heat! What I loved most about this book was the fact that the romance DOESN’T FIX SADIE. In order for Sadie to fix Sadie, she had to decide for herself that she wanted to change and I liked that Andrew stepped back and allowed her that space to work out her issues on her own. I kind of wish more New Adult romances did this because love isn’t alway the answer to our problems. Overall, Co-Wrecker was a home run and I can’t wait to binge-read more of Meghan Quinn’s books in the near future. With their second anniversary quickly approaching, Dane and Kat Cross are hoping to salvage the remaining pieces of their marriage before it’s too late. They escape to a private island for some alone time in order to tackle their issues without any distractions. But when things take an unexpected turn, their relationship will be put to the ultimate test. Will Dane and Kat’s marriage survive, or will one final lie break these two apart? I went into Take Me Back expecting a love story about two people trying to rekindle the flame and work out their issues. I was expecting scandalous lies, heated discussions, moments of passion and maybe a few tears here and there. BUT NO, THIS BOOK WAS SO MUCH MORE THAN THAT! I don’t want to give too much away, but I did not see the plot twist coming at all in this book. Meghan March just threw us for a loop and didn’t even give us time to catch our breaths! The action, the suspense, the thrill, it was all just so good and I was holding my breath until the very end. While I loved the plot and the writing, I didn’t really find myself connecting with either Kat or Dane. I understood why they felt the way they felt and you definitely see that this is a pair who is still very much in love and not yet ready to say goodbye to each other, but I just didn’t care for them as individuals. I was invested in the relationship yes, but I was more so invested in the plot and the twist more than anything else. 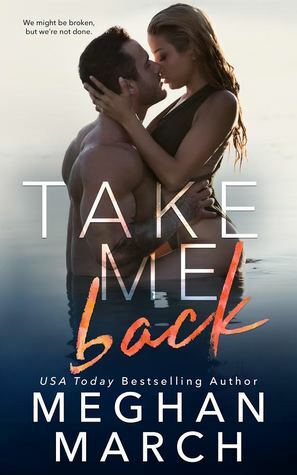 Take Me Back was my first Meghan March book, but it most certainly won’t be my last. If you’re looking for a romance with a twist to keep you one your toes, I highly recommend you check this book out. I love these mini reviews all packaged into one big great one. 🙂 I felt the same way about Josh and Andrew. Josh was so adorable. And Andrew. Andrew was HOT!